McAlister's Deli makes the best glass of sweet tea I've ever had. Pop into one near you tomorrow for your own 32 ounce cup free of charge! RIDGELAND, Miss. (July 11, 2012) – Free Tea Day is back by popular demand at McAlister’s Deli. 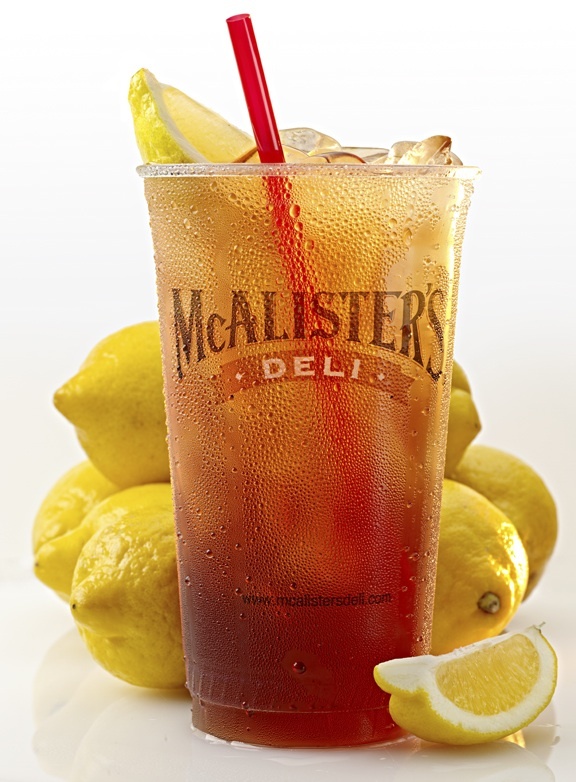 On Thursday, July 26th, guests who visit any of the participating McAlister’s Deli locations will get a free 32-ounce, signature McAlister’s Famous Sweet Tea™. No coupon is required and no purchase is necessary. McAlister’s Famous Sweet Tea™, the 23-year-old restaurant’s signature drink, is hand crafted several times each day to insure optimal freshness. McAlister’s Famous Sweet Tea™ is a rainforest certified black tea blend and is made exclusively with filtered water and pure cane sugar for a high quality taste. Free Tea Day began in 2009 and has become an anticipated annual summertime event. McAlister’s is promoting Free Tea Day with a myriad of in-store and social media activities including weekly photo contests and a “Sweet Tweet of the Week.” Details can be found at www.mcalistersdeli.com, on Facebook at www.facebook.com/TeaFreaks or on Twitter at www.twitter.com/MCALISTERSDELI, follow @McAlistersDeli. Founded in 1989, Ridgeland, Mississippi-based McAlister’s Deli is a quick-casual restaurant chain known for its sandwiches, spuds, soups, salads, desserts and McAlister’s Famous Sweet Tea™. In addition to dine-in and take-out service, McAlister’s also offers casual catering, with a selection of deli and sandwich trays, vegetable, cheese and fruit trays, breakfast trays, box lunches and desserts, McAlister’s Deli currently has 307 restaurants in 22 states. McAlister’s Deli has earned numerous accolades, including most recently Nation’s Restaurant News ranking the chain fourth in its inaugural Consumer Picks study, the highest of any sandwich chain and higher than any bakery café restaurant. For more information, visit www.mcalistersdeli.com. A part of the restaurant industry for over 26 years, The Saxton Group has a rich history of multi-unit and multi-brand development. Initially a small operation with two restaurants, the group has evolved into industry veterans and leaders with locations operating in more than four states. The company is currently the largest McAlister's Deli franchisee in the country, one of Restaurant Franchise Monitor's Top 200 restaurant franchisees, and is aggressively expanding McAlister's Deli and Pinkberry concepts throughout Texas. Through the years, The Saxton Group has maintained a family approach to business and takes pride in teaching every employee about the restaurant business from the ground up. The group is headquartered in Dallas, Tex., and one was recently named a Dallas 100 company for dynamic growth by SMU's Cox School of Business. For more information, please visit www.thesaxtongroup.com.